Hives, also known as urticaria, are a common cause of an itchy skin rash. 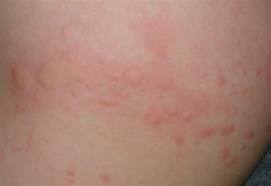 Hives typically present as itchy red bumps or red bumps with a pale center. There are many causes of hives including medications, foods, and illness. Some of the common foods that cause hives include shellfish, nuts, and berries. Common medications that cause hives include aspirin, penicillin, sulfonamides (sulfa-drugs), and anti-epileptic medications. Other less common causes of hives include infections, autoimmune causes, friction, pressure, vibration, cold or hot temperature, exercise, and sunlight. Clinical history and skin evaluation helps a dermatologist determine appropriate treatment options which may include antihistamines, steroids, as well as careful avoidance of triggers.